Boris has just finished modernizing the 4 day program found online in the old spreadsheets and the new one looks like a lot of fun! Previously it was listed as appropriate for CMS/MS class lifters. That is no longer the case. The 4 day now applies to Class 1 and CMS. See more info here. It consists of 20 weeks broken into four blocks: adaptation, accumulation, transmutation, and realization. When he created this new program he added front squats to the first month as a corrective exercise for a very common problem he's seeing lately: leaning forward in the squat. Similarly, the rest of the program fits the typical lifter's profile so modifications may be needed in your case. See more info here. This program comes in only one flavor unlike the three day program. Why? Because it gets less and less productive to create universal programs as the class of the lifter rises. So take this one as the base and make it work for you. 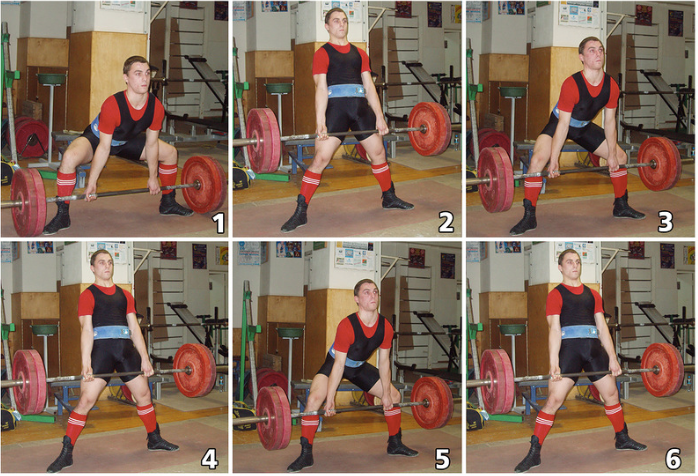 There is one deadlift special exercise you may not be familiar with. It's called the 1 1/2 deadlift here. Basically you lift the barbell up then lower it to your knees then bring it back up again. Sometimes you lower it to the knees twice (1 + 2) and sometimes only once (1 + 1). Special thanks to FreakGoHome for coming up with a way for the intensity zone charts to update automatically when you make changes to individual exercises. Modifying the program (which you should do as needed) is now a bit easier. When he created this new program he added front squats to the first month as a corrective exercise for a very common problem he's seeing lately: leaning forward in the squat. This is mainly a problem for closer stance, high bar style squats, correct? I feel like I have to lean over a bit with my wider stance, low bar technique. Or is it more referring to the upper back losing tightness during the lift? Thanks so much for posting this new 4 day program. Its good to see that more 4 day options are becoming available. I always worried that I was splitting up the volume incorrectly when trying to divide up a 3 day program to a 4 day split. This is for low bar and it's to fix your back angle changing excessively during the lift. And a hell for me...! "Hard in the training, easy in the battle"
Yeah, I agree. I forgot that was in there too. A clarification please: in bench (or deadlift) w/ chains the weight percentage includes the weight of the chains and in bench (or deadlift) w/ chains plus the weight it doesn't, right? Load up the bar with the weight given in the spreadsheet then add the chains on top of that weight. One or two links on the ground in the top position and the extra weight off in the bottom position. This way the extra tension is precisely controlled. "Squat w/pause at half squat position on the way down"
Lastly: what board height is the one in mind for the percentages given in the program? Thank you very much for putting in so much time with this. There's a so much to pick up here! I am assuming this is the the universal program i have heard about a few months ago. 1. Out of curiosity, what is the purpose of having 2 skills test weeks? Especially one during the last prep cycle. 2. If changing exercises to fit one's need, should we maintain the volume (NL) and decrease intensity (%max) or maintain intensity and adjust volume?